Unlike other gluten free treats this recipe calls for almond flour and coconut flour, which both give you a boost of added protein. These are not only great as a dessert but can double as a quick breakfast the next morning, bonus! These will bliss you out because they only contain a few natural ingredients, and get their sweet flavor and satisfying richness from healthy nuts, and dried fruit. If you can’t go without a bit of chocolate, like myself, throw in some dark chocolate chips, delicious! Place the pine nuts, sunflower seeds, and almonds in a food processor and pulse until coarsely ground. Add the dried cranberry and chocolate, pulse a few seconds, then add the maple syrup, vanilla, and nutmeg. Continue to pulse until the mixture begins to stick together. Taste for sweetness. Add more maple syrup if desired. Place the coconut flakes in a shallow bowl. 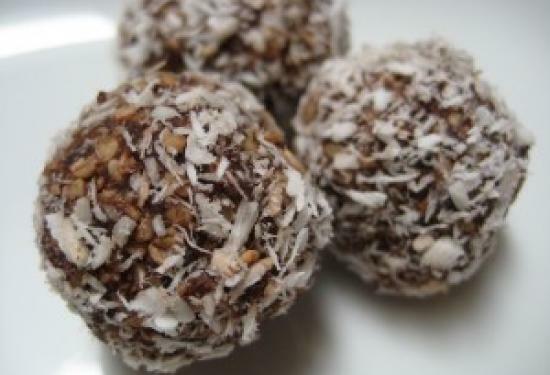 Roll the nut and fruit mixture into 1-inch balls and roll them in the coconut flakes. Store in an airtight container. 3. Carmel Corn, courtesy Cupcakes and CashmereThis recipe is not as health as the other 2 options, but it is a classic that just feels like Halloween. You can always substitute a vegan spread for the butter! Remove from heat. Stir in baking soda and vanilla. Pour over the popped popcorn. Stir popcorn until evenly coated. Bake for 25 to 30 minutes in the preheated oven, stirring every 10 minutes. Remove from pan and put into a large bowl to cool.